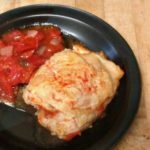 Sweet Hungarian paprika and rich sour cream combine to make Chicken Paprikash, an incredibly luxurious stovetop dinner that’s still easy enough to make on a not too rushed weeknight! I’m going to start by telling you that I have no idea where this recipe came from, originally. I mean, I know where I have it now – written in my own handwriting on a looseleaf page in the notebook I have used for recipes since… well, actually this is my third notebook. My first fell apart long ago, and I trashed the second (with its broken cover) a few years ago. But I started the first one when I first started cooking in college. And I may have had this recipe that long… since I did eventually start to write down sources, but I did not write where I got this. But I know I have been making it for decades. It’s that good. I think it was originally authentic Hungarian, but I can’t swear to it… and I’ve tinkered a little bit. 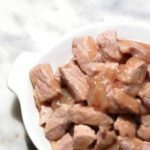 The biggest change, really, was that I doubled the amount of paprika, after making a few other Hungarian dishes that I knew were authentic, which use it in much greater amounts than the original called for. 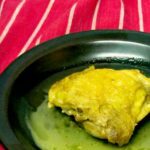 Otherwise – I left out the lard (modern chicken has enough of its own fat) and of course I use gluten free flour to thicken it. 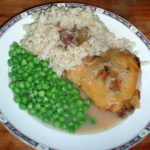 I also used chicken thighs, instead of cutting up a whole chicken – and reduced the sauce in proportion. And sour cream. I would not, myself, use Light Sour Cream, made of skim milk and thickeners… it behaves differently when heated. 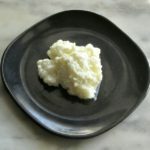 If I really wanted to make it for someone who seriously needed to limit fat (a family member had gall bladder issues at one point, and I had to be very careful cooking for him) I’d use Greek yogurt – I did have success with that back in the Fat is Evil days. But the richness is a crucial part of the dish. 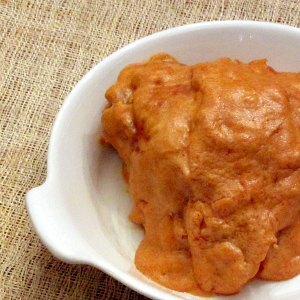 Make sure you serve Chicken Paprikash with something to eat with the sauce! I understand spaetzle or other forms of egg noodles are traditional (and one of these days I’ll try making gluten free spaetzle – shouldn’t be too hard) but I use my ubiquitous rice, and it’s delicious. Take four chicken thighs, with skin and bone. Place them, skin side down, in a cool frying pan and cook over medium heat, while the fat renders out, until the skin is golden. (About five minutes, maybe a few more.) Turn over and brown the other side as well – usually a little under five minutes. Remove from the pan to a plate, and reserve until later. Drain off most of the chicken fat, leaving some in the pan, and add a chopped onion. (I chop it while the chicken is browning.) 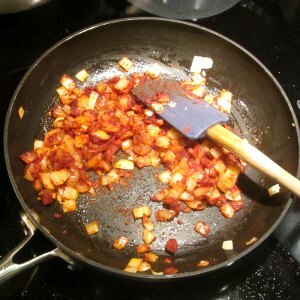 Stir it around well in the chicken fat, and saute until golden – about another five minutes. Part way through that, add a teaspoon of chopped garlic – one or two largish cloves. When the onion is golden, remove from heat, add a pinch of salt and a tablespoon of Hungarian paprika. (Yes, a full tablespoon.) Stir it in well so it is all mixed with the chicken fat and the onions are coated. Return it to heat, and add the chicken stock. Bring to a simmer, stirring well to incorporate any browned bits in the pan. Return the chicken to the pan. Cover, and simmer about twenty minutes, turning the chicken over half way through, until the meat is fully cooked. Stir flour into the sour cream. 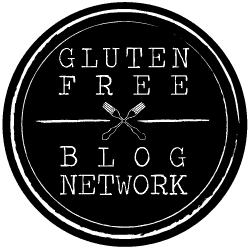 The best gluten free flour I’ve found for absorbing fat in a sauce is brown rice. It doesn’t brown as well as some other gf flour, but that’s not relevant in this dish. You can use whatever flour you like best for this (including of course wheat if you don’t need it to be gluten free!) And no, I don’t use my roux cubes here… this sauce is, atypically, not made with a roux. Just mix the flour and sour cream well. Remove chicken from the pan. (Isn’t it beautiful?) Skim the surface of the broth to remove any extra fat. 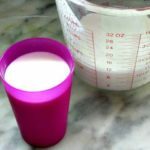 Stir the flour and sour cream mixture into the simmering liquid, and simmer five minutes of so until it is smooth and thick. Then return the chicken to the pan briefly, to reheat and coat it with sauce, and serve at once. I put the chicken on a platter and pass the sauce in a gravy boat so everyone gets plenty! Now – a note. The thick sauce does completely coat the chicken, and my mother in law had a little trouble locating the bone to cut the meat off it – too hard to see clearly. (This might be an issue for a young child, as well.) Another time I might serve her chicken without the sauce until she has a chance to cut it, and then pass the sauce, to make it easier… She kept at it until she ate every shred, though! Apparently Chicken Paprikash is worth the effort. 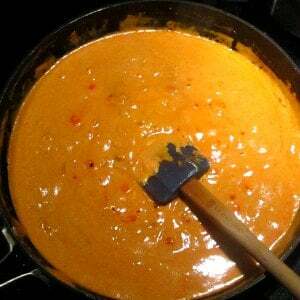 Sweet Hungarian paprika and rich sour cream combine to make Chicken Paprikash, an incredibly luxurious stovetop dinner that's still easy enough to make on a not too rushed weeknight! Place chicken thighs, skin side down, in a cool pan. 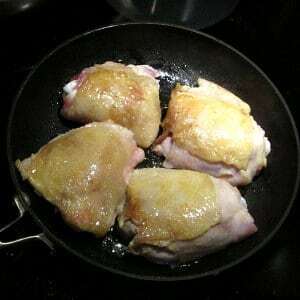 Cook over medium heat until fat renders out and chicken becomes a golden brown, about five minutes. Then turn over and brown the other side. Remove from pan and reserve. Pour off and discard some of the fat. Add the onion to the pan, and saute a few minutes, then add garlic. Saute until onion is golden. Remove pan from heat. Add salt and Hungarian paprika, and stir well to coat the onion and mix paprika into the fat that is left. Add stock and return to heat. Bring to a simmer, stirring well to get any browned bits stuck to the pan. Return chicken to the pan. Cover and cook for 20 minutes or until meat is cooked, turning half way through the cooking time. Remove the chicken to a serving platter. Stir gluten free flour into the sour cream, and stir that into the simmering liquid in the pan. Let simmer, stirring often, until the sauce has thickened and is smooth. Return the chicken to the pan briefly to warm and coat with sauce. Then serve, passing the sauce in a sauceboat. Serve with gluten free egg noodles or rice. Well this sounds like a great chicken dish to me. The sauce would be great on some rice or mashed potatoes. I have some nice smoked paprika that I think would work great in this dish. Perfect for any night of the week, and entertaining worthy too. This reminds me of a dish my German granny used to cook for us. 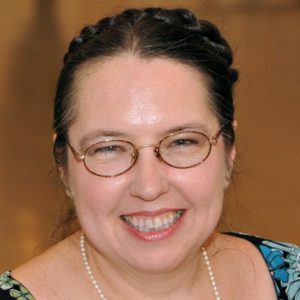 She didn't call it Chicken Paprikash but German and Austrian Cuisine has adapted a lot of dishes from Hungary, Poland and the Czech Republic over the decades and renamed it. 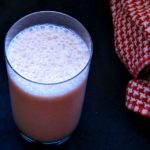 I will definitely try your recipe and cannot wait to get that taste of my childhood again! There's a lot of crossover in Eastern Europe... Try something that tastes good, why wouldn't you make it your own? And I do hope it tastes right for you! Thanks for telling me about that! Sour cream and Hungarian paprika make for a wonderful sauce. I would try over fish for me and leave the chicken to my husband :-) . It would be amazing over fish... Enjoy! I recently had this dish at a local restaurant and it was so, so good! I was hoping to make it at home soon, so I'm glad to see that you have a tried & true recipe that's served you well for so many years. Can't wait to try this one out! Oh, perfect! I'm glad I came along with it at the right time for you. Enjoy it! This recipe looks amazing. 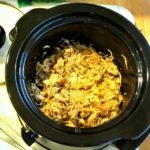 I had a friend who made a version of this recipe in her slow cooker, but this is much more flavorful. I didn't realize there was a Hungarian paprika. I only though there was the regular one and the smoked one. Oh, look for the Hungarian - it's a much different flavor! And thank you - it really is very good. I am so intrigued by Hungarian paprika. I want to try it now. Isn't it interesting that there are a few versions of paprika, all different from the other? 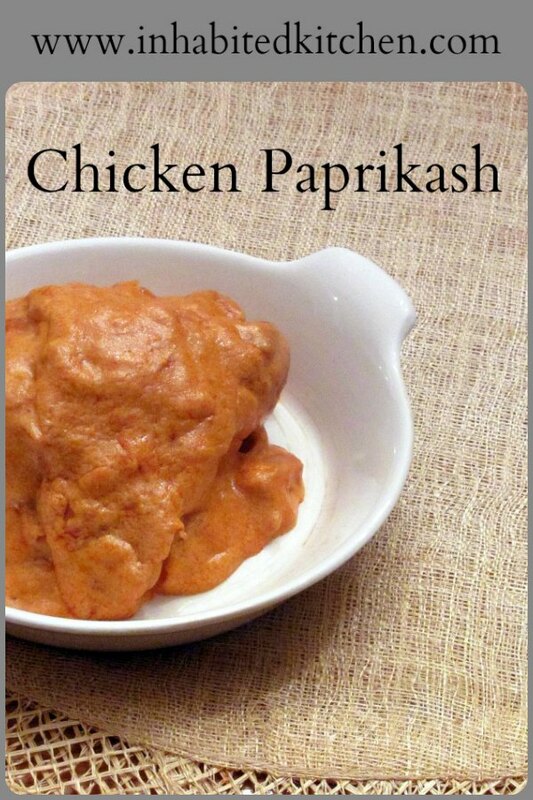 This chicken Paprikash looks so delicious that I want to try it straight away. I'm on a mission to try Hungarian paprika and will let you know what I think when I make it!! I'd love to hear! Well, paprika is powdered dried peppers, and there are so many kinds of peppers - sweet to hot... I love knowing a variety and trying them in various recipes! Such a pretty color and sounds so delicious. Love Hungarian paprika so I know this will be good. Saving this for later. Sounds yum! Isn't it pretty? And you get such a rich sauce... Enjoy it! This really does have the most beautiful color from the lovely paprika. I'm glad you just used chicken thighs as it's so much less work to buy a package of those than break down a whole chicken. Looking forward to trying this one! Thank you! Yes, sometimes I want the whole chicken, and that's what I used to cook, but often it's just so much easier, serving the family, to have pieces that are more or less the same size and will all cook in roughly the same time. (Aside from not having to cut things up!) Enjoy it! Hungarian paprika has such a great sweet, smoky flavor and it adds such a great color to the dish. I always cook with chicken legs and thighs because they have so much flavor. This is definitely going on my menu this week. The one I get, at least, is not really smoky - though I bought smoked Spanish paprika at the same time. But it's a wonderful flavor, not quite like any other I've had... makes the most amazing sauce. Enjoy it! 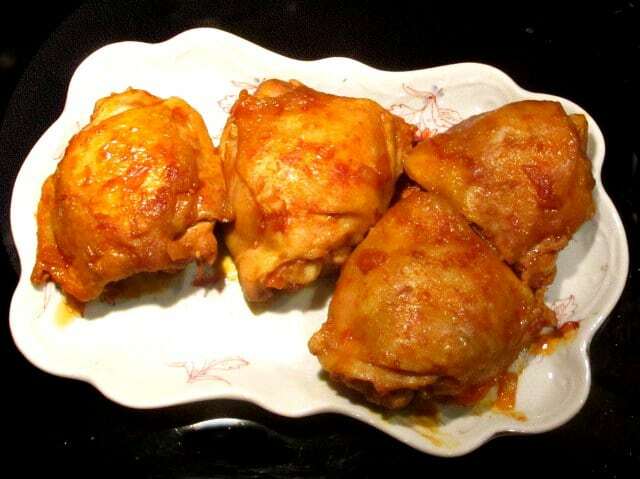 This chicken looks so yummilious!I bet the gravy or sauce would go so well with steamed rice! It's great with rice! You want to make sure you get every drop of that sauce... Thanks! I love adding paprika to my meals and had no idea that different areas render different tasting paprikas. This looks so good, I'd love the sauce on just about any dish. I think it's more that different cultures like different seasoning... There is hot Hungarian paprika, but it's not the most commonly used - this is. Lots and lots of flavor, but without much heat. I don't think I've ever actually had paprikash before - but this sounds so good I'm going to have to give it a shot. I'm going to order some hungarian paprika and get to it! Enjoy it! It really is delicious - and not much fuss given the punch of flavor. I've never made this, but clearly I need to. Those recipes that have been around for so long you don't even know where they came from are the best!